Eight years ago we make our first ice hockey rink during the Winter Games in Vancouver! 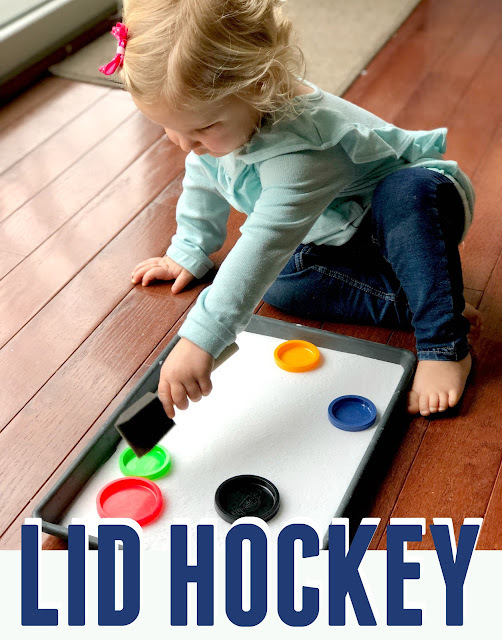 My toddler and I had so much fun whacking the "puck" around and playing on the slippery surface. Now, just a few years later, it was fun to try out a new twist on our ice hockey rink and play some lid hockey! 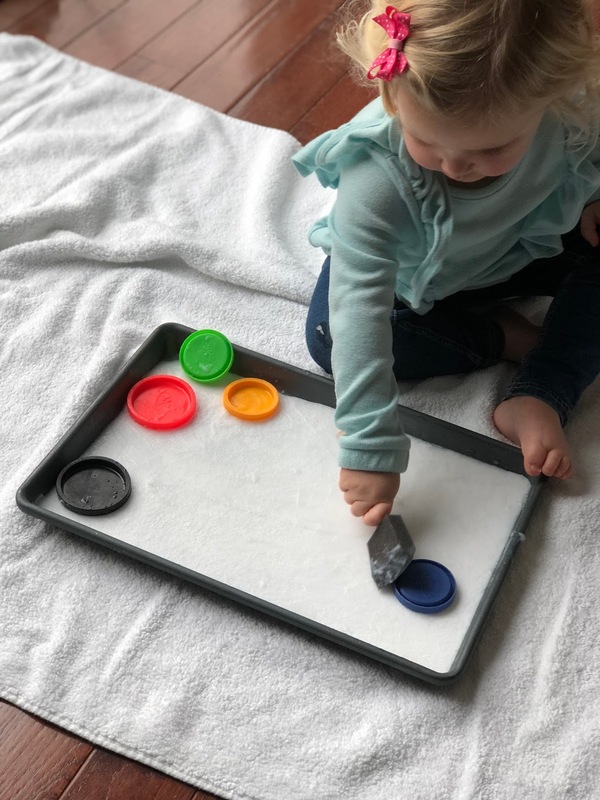 All you need is a tray of ice, some baking soda, a paint brush or two, and playdough lids (or milk jug lids). This post is part of our Toddler Winter Games series! 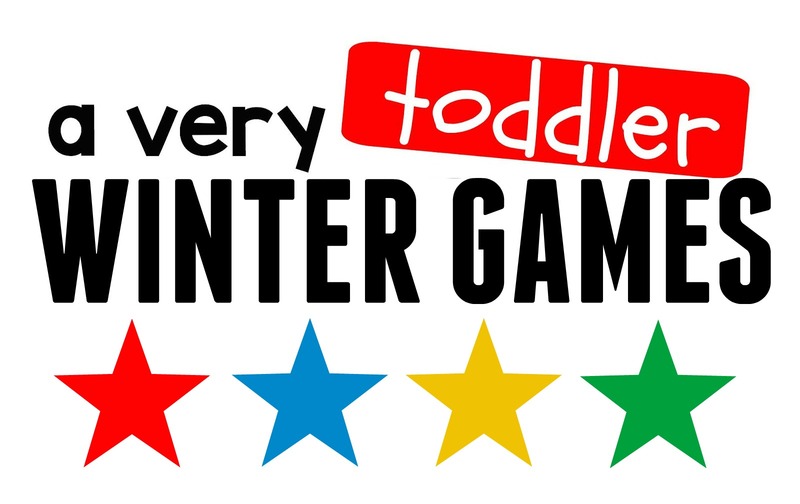 Each day this week (for FIVE days) we'll be sharing simple winter games themed activities along with Susie from Busy Toddler. You can follow us for more ideas on Instagram using @kristinatoddlerapproved (that's me!) and @BusyToddler. This ice is my favorite. You start by mixing a half of cup of baking soda into a small pitcher of water. 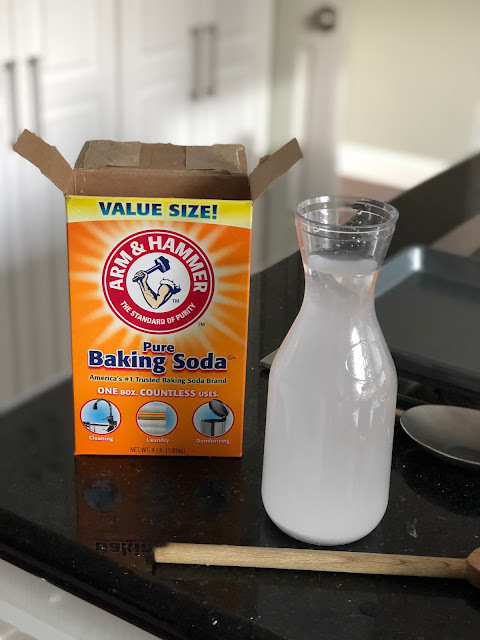 Then you pour out the water/baking soda mixture into a small baking sheet and then you mix it and put it in the freezer to get hard. It takes a few hours to harden up! We put our pan in around 8pm and were able to play with it by 12:15pm. Once the ice was all hard, we grabbed a towel to lay underneath the mess and then we started playing! 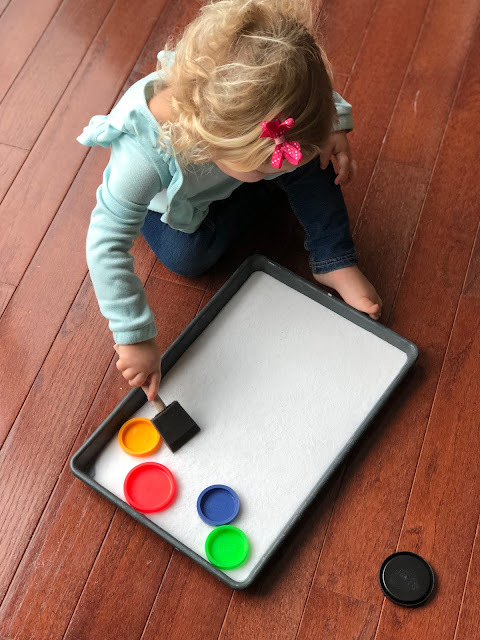 This activity is a great way to play with LIDS! Grab your favorite lids and be ready for them to be flying all over! We tried out several paint brushes but these foam brushes were the biggest hit! Craft sticks also work! Once my big kids were home, we played a back and forth game of hockey on the ice. Make sure you put a towel underneath the baking pan so that you don't destroy your floor with baking soda. I may know this one from experience! Anything that can help me (or my kids) make it to dinner without throwing a big tantrum is a win in my boots lately! What else is on your, "must occupy this toddler and get something done" list?